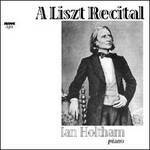 Ian Holtham's acclaimed recital showcases works by the great, enigmatic, and quintessentially romantic pianist and composer, Franz Liszt. It begins with transcriptions of three songs to sonnets of Petrach, and progresses through Liszt's tribute to victims of the Hungarian uprising of 1849, "Funerailles", and the devilishly inspired and fiendishly difficult "Mephisto Waltz no. 1". It finishes with his monumental Sonata in B minor, perhaps the closest a composer could come to the creation of a musical universe.